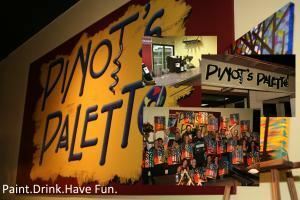 Pinot's Palette is the upscale "Paint. Drink. Have Fun." destination in Valencia where anyone can be a Picasso. No art experience required! In two or three hours you can create any number of our festive, whimsical and pretty paintings. We'd love to help you celebrate Girls' Night Out, Double Date Night, Birthdays, Bachelorettes, Anniversaries, and offer private parties! Your featured masterpiece can be selected from any 2-hour work we've previously painted or we can work with you to develop a new painting specifically for your party. We provide the canvas, easel, brushes, paints, & apron... all you need to bring are any appetizers you may want for the party. We also have plates and utensils. Private Parties can be held anytime except Thursday, Friday or Saturday nights based on availability. All other available days & times can be reserved with a guaranteed minimum of 15 painters. Thanks for considering Pinot's Palette for your private event! Our painting parties are always memorable; fitting for birthdays, showers, corporate gatherings and teambuilding events, or simply a fun night out! Please read below to learn about our pricing and policies: 1. Deposits -Private parties are booked by placing a refundable deposit of $250 to secure the desired date and time, after availability is confirmed by the studio. -A host may elect to apply the deposit, partially or in full, to any party charges or individual seats. If the full cost of the party is met separately, the deposit or remainder of the deposit is refunded after the party takes place*. *Cancellation Policy: While we regret to lose the opportunity to paint with you, our party cancellation policy is in place to protect the professional artists who are booked specifically for your party. For this reason, we firmly require a minimum of 5 business days’ (M-F) notice of cancellation before your party date to grant a deposit refund or rescheduled date. A deposit placed with less than 5 business days' notice before the desired party date will not be eligible for either refund or reschedule. 2. Pricing The Valencia studio is available for private parties anytime another private party or public class is not scheduled. The Main Room has a required minimum of 15 painters and a max. capacity of 46. Seats are $35 each for a 2 hour painting session, $45 each for a 3 hour painting session (determined by painting selection). 30 minutes before the painting session and 30 minutes after the painting session are included in the per person pricing. Party duration may also be extended at $50 per 30 minutes. A link to the party registration page will be provided to the host, and we do encourage guests to sign up for the party in advance. 3. Click here to visit the Painting Library -Please provide your desired painting selections. It is not required that you choose a painting before booking your private party, but the final selection must be confirmed with the studio at least two weeks in advance of your scheduled party date. 4. Party Time! Doors will be open 30 minutes in advance of the official start-time, so that you and your guests may arrive and settle in before painting begins. Feel free to bring along any type of food that you would like to enjoy! Here in the studio we provide all painting materials, aprons, paper plates and utensils, napkins, ice and complimentary bottled water for our guests. 5. Alcoholic Beverages Beer and Wine are available for purchase in our bar, along with other non-alcoholic beverages. We're excited to party and paint with you! Your featured masterpiece can be selected from any 3-hour work we've previously painted or we can work with you to develop a new painting specifically for your party. We provide the canvas, easel, brushes, paints, & apron... all you need to bring are any appetizers you may want for the party. We also have plates and utensils. Private Parties can be held anytime except Thursday, Friday or Saturday nights based on availability. All other available days & times can be reserved with a guaranteed minimum of 15 painters.